Humans win Earth’s evolution trophy. Some animals go for size, speed, or camouflage to make it to the top. We went with brains, and it totally worked. Proof: A human is writing this blog post, not a tapir. Take that, every other animal. Just because we’re “a-ok number one species” doesn’t mean we win in every category, though. Plenty of things are faster or swimmier than us, and plenty can still beat us in a fist/hoof fight. Sheer mass is usually an instant win in the animal kingdom, yet somehow we scraped through with middling height and weight. How? Magic, that’s how. But where do humans really stand on the size chart? If you arrange all the species by weight, where would our sapien selves fit in? I hunted down some numbers and came up with an answer just accurate enough to satisfy my curiosity. As it turns out, people have done similar calculations before, all relating to shoving critters on Noah’s ark. If you include insects, the average size of all non-marine creatures is about as big as a housefly. Exclude insects and it jumps to the size of a sheep. Most people I know are bigger than a sheep, so it looks like we’re doing ok so far. Big brains and big bodies, the complete package. There weren’t any numbers to back the above claims, so the search went on. I ended up compiling a list of nearly 1,300 animals along with their average adult weight. Then I pressed the “math” button and answers were found. The important number is the last one, as it’s the only one that isn’t skewed by enormous creatures. And when I say enormous, I’m looking at you, whales. On the list of 1,300 modern animals, whales occupy the top 13 slots. Include dinosaurs and they still take up half of the top 20. 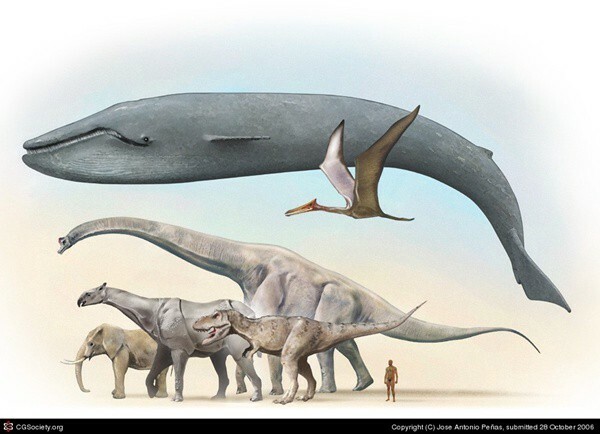 In fact, the weight of the biggest dinosaur is one gray whale short of a blue whale. Also, the heaviest three species of whale outweigh every other mammal combined. There’s a great yo’ mamma joke in there somewhere, but I’m too awestruck to find it. Forget whales, let’s talk about us. Squeezing humans on the scale puts us surprisingly close to the top. We’re bigger than 87.6% of the mammals on Earth. Adding in things like birds, reptiles and fish doesn’t change that figure by more than a percent, nor does dropping whales from the spreadsheet. And just in case you’re mad at the 12.4% of the creatures that are bigger than us, remember we’re smarter than 100% of the animals. The moral of the story is there’s a lot of really tiny things on the planet. Or maybe we’re just better at weighing them. Ignoring aquatic and semi-aquatic mammals, the hippopotamus, buffalo, bison, elephant and giraffe are the largest animals. Elephants and hippopotamuses are the only terrestrial mammals to appear on the top 30. Estimates of the largest fish to have ever lived, leedsichthys, puts it at 22,679 kg. Seventh on the list. The European sturgeon is thought to be the heaviest modern day fish, with the largest one weighing 1,140 kg, 30th on the list. Their average size is only 240 kg. The top ten largest birds are all flightless. Ostriches are the heaviest at an average of 280 kg. After that, it drops to around 100 kg with the cassowary. The largest flighted bird weighs a pithy 15 kg. The white-toothed pygmy shrew is the smallest mammal, weighing an average of about 9 grams. The brookesia micra is the smallest reptile and weighs less than 0.2 grams. Crocodile and tortoise variants occupy the biggest animals on the reptiles list, but they start out at less than 990 lbs and plummet from there.